In the time of the 12th edition of the international Lighting Guerrilla festival, Ljubljana will again come to life with a series of light installations that will illuminate its city centre. This year’s festival will be especially vivid and colourful: featured artists, both Slovenian and international, will present their works created in the theme of colours, the main topic of this year’s festival. 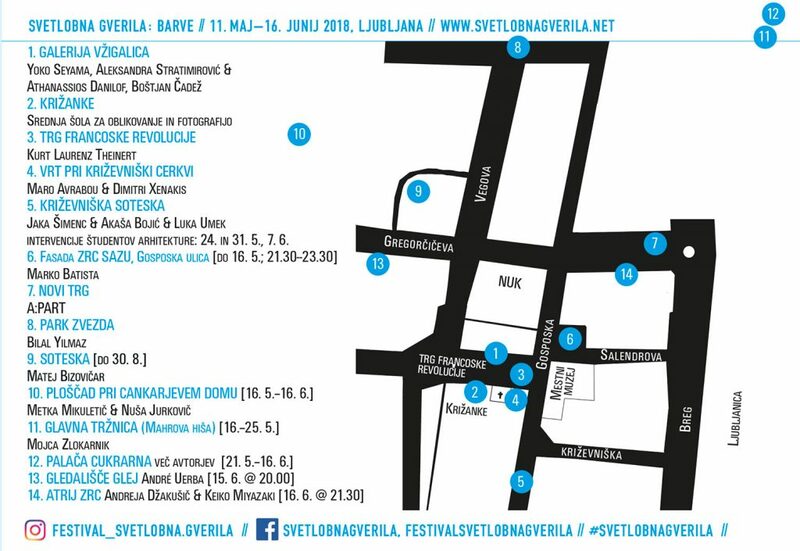 As usual, the festival will take off with the exhibition in the Vžigalica Gallery and several outdoor projects in its immediate vicinity, followed by lighting events in the city marketplace. The opening of a group exhibition in the Cukrarna building represents the culmination of the festival’s happening for the second time in a row. A series of activities titled »Lighting Guerrilla Laboratory« is conceived as a set of educational workshops, with results presented as part of the festival itself. A separate number of events with guided tours will also take place in the time of the Summer Museums Night on June 16th, before the festival’s lights will be turned off for the last time. And, by the way, in autumn you can find us on the Slovenian coast, in the town of Izola, with a minor travelling festival edition titled Re: Action. As said before, this year’s festival will be especially colourful: with the theme of the forthcoming Lighting Guerrilla we intend to explore the role and significance of colours in the context of contemporary art. 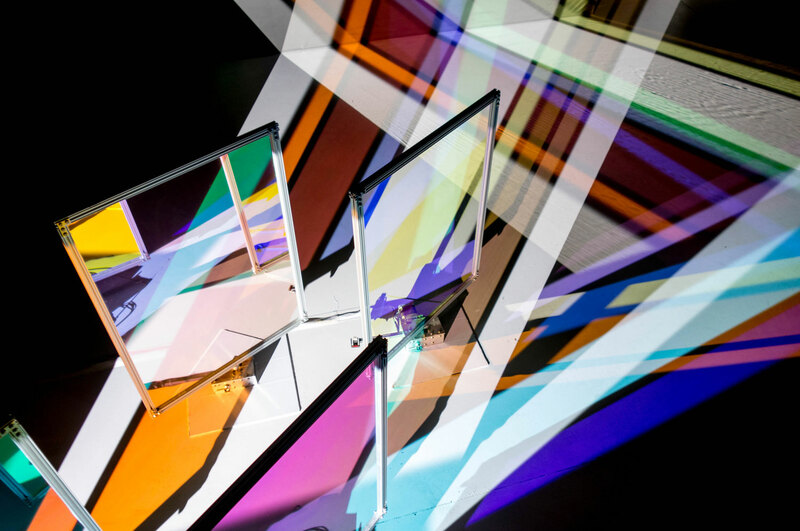 Many of the artists featured in the festival explore the beauty and symbolism of colours as well as their physical or optical properties, achieving special effects through various manipulations and interventions. Colours are sets of information that allow us to navigate the world, while at the same time they make it appear more attractive and pleasant. Colours are an important element both in art and in everyday life, as they affect one’s perception of the world as well as one’s emotional state. The artistic projects present different aspects of colours while introducing playful explorations of colour effects, thus creating enchanting and aesthetically elaborated ambiental compositions. For those of you who don’t know it yet: the international Lighting Guerrilla festival, taking place in Ljubljana since 2006, is dedicated to production and presentation of works of contemporary visual and new-media art where light is used as the basic means of expression. The aim of the festival is to reshape the image of the city by deploying light objects, installations and projections, thus bringing contemporary art closer to the wider public. The festival tries to focus general public’s attention to the role of art in everyday life, as well as to the artist’s role and position in shaping of the public space. In addition to the presentation of international contemporary art projects, the aim of the festival is also to encourage Slovenian artists to produce new artworks especially for the festival. ARTISTS: Aleksandra Stratimirović (SE/RS) & Athanassios Danilof (GR), Yoko Seyama (DE/JP), Boštjan Čadež (SI), Kurt Laurenz Theinert (DE), Srednja šola za oblikovanje in fotografijo, Maro Avrabou & Dimitri Xenakis (FR), Jaka Šimenc & Akaša Bojić & Luka Umek (SI), Marko Batista (SI), Matej Bizovičar (SI), Chaga Unsane Designs (SI), Bilal Yilmaz (TR), Metka Mikuletič & Nuša Jurkovič (SI), Mojca Zlokarnik (SI), Andreja Džakušić (SI) & Keiko Miyazaiki (SI/JP), Miran Kreš (SI), Marija Jenko (SI), Natan Esku (SI), Natalija Črnčec & Nina Šulin (SI), Erik Mátrai (HU), Akademija za likovno umetnost in oblikovanje (SI), Fakulteta za arhitekturo, Tina Mozetič (SI), André Uerba (PT), udeleženci Laboratorija Svetlobne gverile..